Josh came into NYC last weekend for a whirlwind trip, and I was able to spend about an hour with him in a Brooklyn cafe playing with the PCB and talking about the current timeline for the project. He's said previously that he'll eat his hat if the campaign doesn't launch in 2015, and he confirmed that he'll be sticking to that promise. (He had his hat with him in the cafe. I must say it didn't look very appetizing.) The designer he's collaborating with is still finalizing the plan for the bamboo-aluminum case and keytoppers, and Josh hasn't yet had a chance to test the PCB and make sure that it's working as it should, but he says both of those things should be happening quite soon. Even without the keytoppers, I was able to get a good feel for the action of the switches. Their actuation point is nice and light, and they're deep enough to give satisfying haptic feedback with each press (unlike the very shallow Stenoboard keys, which sometimes require you to pound a bit to make sure you've actuated them). I found them very comfortable; much more so than any NKRO qwerty keyboard I've tried, though still of course not at the level of the ridiculously expensive lever-based optical professional steno systems. But considering that the price is still expected to be around $300, that's pretty dang impressive. I'm very excited. We've just gotta wait for the testing on Josh's end (fingers crossed everything works and nothing needs to be redesigned! ), the finalization of the case design, and the pricing out of manufacturing and assembly costs. Stay tuned for more as it develops! it's still too expensive for someone who's just curious about this, and don't have professional aspirations. 300 usd. since the ipad launched in 2010, 300 dollars is sort of the default price for all electronics. Yeah, I agree. It's not necessarily the thing you want to start out on, though it's a great intermediate option for people who know they want to stick with steno. There are $100 NKRO keyboards out there, but I really wish there was still a $45 option like there was when Plover got started. Argh, why did Microsoft have to stop manufacturing the Sidewinder X4?! To me the most interesting thing about Stenosaurus is that it translates on board and acts as a standard USB keyboard. 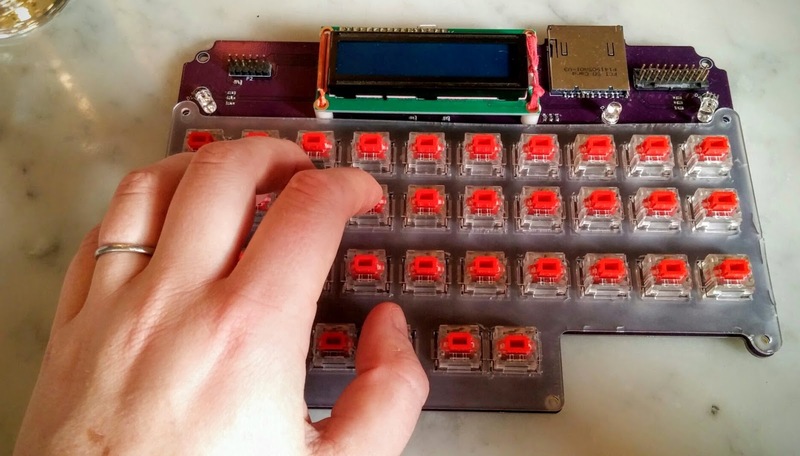 I'm hoping that eventually there will be a module like that that takes input from a standard steno keyboard, say TX Bolt protocol, and outputs as a standard USB keyboard. It would be nice to maintain your dictionary on a module that you can carry around and use on any computer without having to install anything on that computer, yet still be able to use the keyboard of your choice. The onboard translation feature will not be available at launch. Initially it'll just be a Plover passthrough machine. The onboard translation will come later with a firmware update. 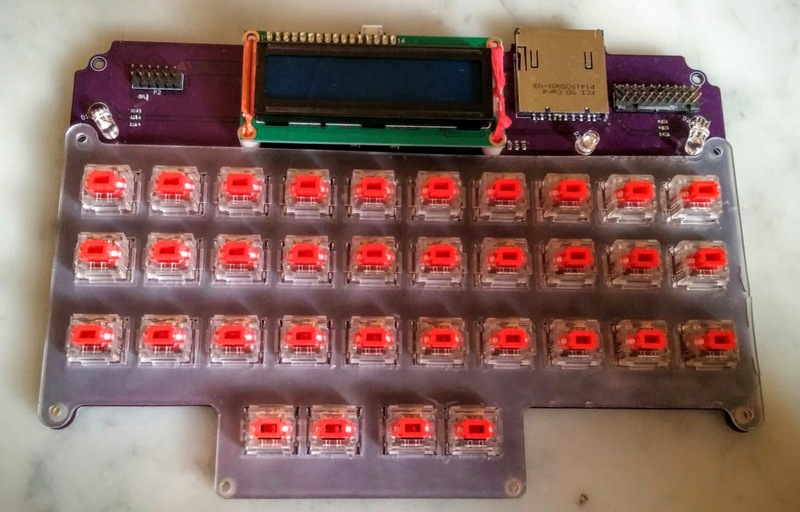 I think that for the cheap we could probably make something cheaper than the Stenoboard by using non-3D printed, simple materials. Probably pretty reasonable to make it sub one hundred dollars and allowing most of the parts to be locally sourced. Really you could probably make something very, very simple that only communicates in TX bolt and is bare bones. The Stenosaurus is striking a different market that's just beginning to exist -- people like me who are learning and want to device that is suited to replace a keyboard and not to serve as a steno machine for use in court. The very compact Stenosaurus is something that I see myself carrying wherever I go. Maybe I'll buy two. Try it out, if it works, then it might be a viable option. It's only 30 bucks and you can always return it. Good thinking, Ted. I've ordered one and will test it with a PS/2-USB adapter. Fingers crossed! What is the difference between the Sidewinder X4 and X6?? I just bought an X6 for this not realizing they were different!! I'm not a gamer so this is all a bit foreign to me. So for some reason I assumed the iRocks keyboard would be PS/2 native but come with a PS/2 to USB adapter that might somehow preserve the 24-key rollover. Other way around, unfortunately. It's USB native but comes with a USB to PS/2 adapter. Since I only have laptops and none of them have PS/2 ports, I'm out of luck. It definitely isn't Plover-compatible with USB only. Not surprising, since the only way to get around the 6-key USB rollover limit is apparently to emulate multiple simultaneous keyboards, which this cheapo thing apparently isn't equipped to do. Sigh. I miss the Sidewinder X4, dangit!! I was also curious about this iRocks, as price is so much a differential here in Brazil. I guess – along with the list of currently supported keyboards – we could make a list of tested supposedly N-key rollover keyboards that doesn’t support Plover. This could also avoid misleading purchases, like the one above, when even if someone finds an out of production SideWinder to buy, it may not work because instead of being model X(some number) it’s SideWinder X(another number). I also didn’t know that when I brought my SideWinder, but was fortunate that it was the X4. Presumably the iRocks would work with Plover if I had a computer with a PS/2 connection, but I don't. That's true of the Das Keyboard as well, I believe. What about something that uses the GPIO on the Raspberry Pi? It's a fantastic project and I'm really looking forward to the result! You've mentioned on your blog a few times that commercial solutions use some type of expensive optical lever technology for the keyswitches. I don't have anything on hand other than a Stenoboard, so I've never had a chance to look inside a more expensive writer (or even hold one in my own hands) and see how it works and I'm rather curious. Do you happen to know how the optical switch detection method works? And since there still must be some form of haptic feedback even with optical detection, is there some sort of spring loaded mechanism typically there too? Poor Josh, hope he can launch early this year, after he digested his hat ;-). Still cannot wait, and I think that $300 for a stenomachine is a very doable price. Would be great if it operated Plover to a true plug-n-play experience, but that will come later as a firmware update, so no problem. Two times now, I have been on an interpreting assignment where we had an embarrassment of riches for interpreters (five) and ONE captioner for a very long take of several hours. I ran Plover on their laptop, used their court reporting machine, and teamed with them - they were ever so grateful. That is how cool PLOVER is! They became a believer, and switched over (now, how do we make the sign of the Plover on the chest?) I really appreciate all that you guys do, and will wait (don't wanna, but will of course) for Stenosaurus to pop on in.